Incongruous - is a word that covers it! Seen from afar it looked like a small rural bus stop miles from the nearest road. 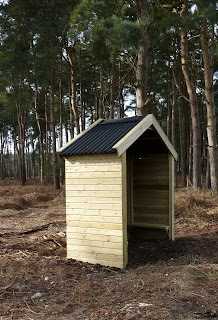 The open fronted shelter stands beside the Hereward Way long distance footpath where it wends its way through a Thetford Forest fire break. This was my destination. I’d come to visit it and take in the carved wooden plaque on the rear wall. Its subject? The Tree of Life! What a place to pause for thought! A small notice explains that the artwork and shelter belong to the Via Beata and names the artist as Cathy Stables.